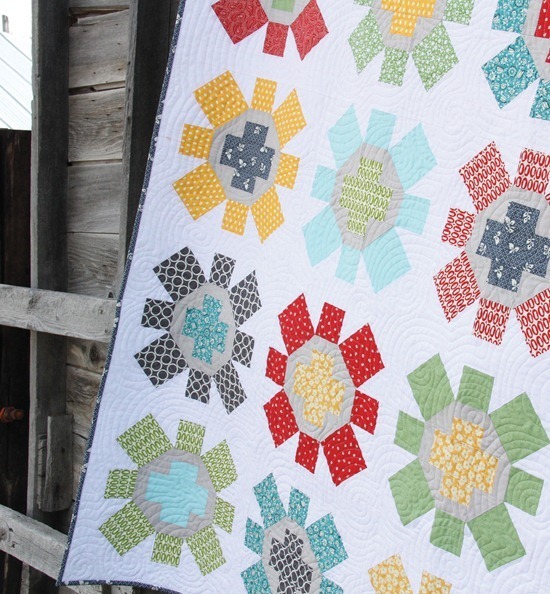 This is my favorite quilt to date…no joke….I love it more than anything I’ve ever made. I made it in “my” colors so I can use it on my bed or the guest bed and stare at it everyday. It’s really fun to put together…and there are only 25 big blocks to make. 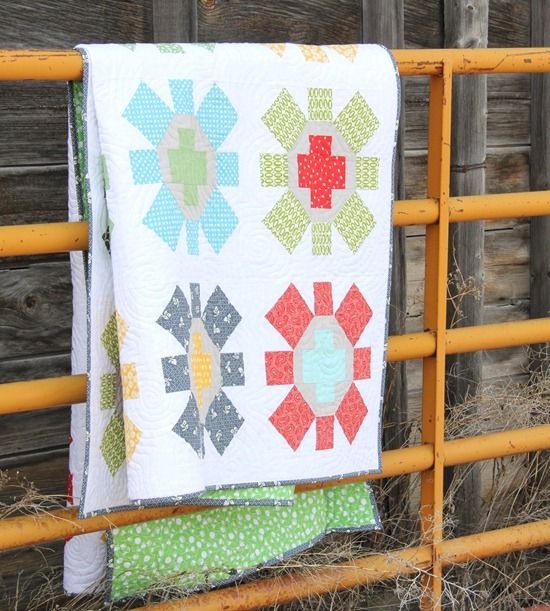 I used fat quarters from all different fabric lines and in bright fun colors…but the grey solid in each block ties everything together. The quilting was done by my favorite local quilter Sheri Bear…she does an amazing job every time. The back is a print by Violet Craft for Michael Miller…a good true green fabric is tricky to find. Spin Cycle is really gorgeous and it is very original. I like that. I don't think I've ever seen that block before. I like the idea you had to harmonize all the blocks by using gray. Congratulations!!! I love all of your patterns…this one might be my favorite, too! This is gorgeous! It is like a breath of fresh air! Looks so fresh and I love the quilting. Fabulous! Beautiful Quilt! Lovely and fresh! I love all of your new patterns but do have to agree that this one is my favorite too! 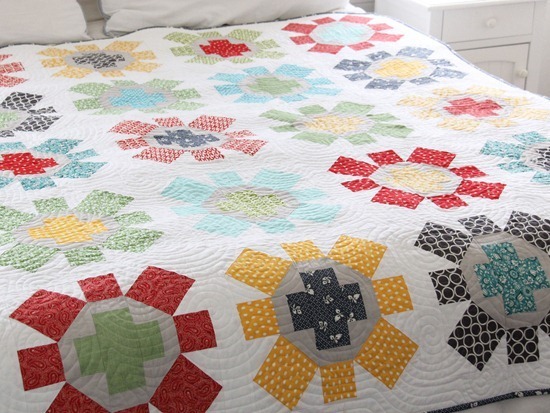 I love your quilt Allison and the quilting is wonderful too!!! it's fantastic!! your colors are great, too! i love it! I love all of your patterns, but I went nuts the first time I saw Spin Cycle and am so excited to be making it!!! Everyone needs to buy Spin Cycle!!! What a stunning quilt! No wonder it is your favorite! The block design is fresh and fun. Awesome job!!! Such a pretty quilt! nice work as usual! this one is my favorite too! 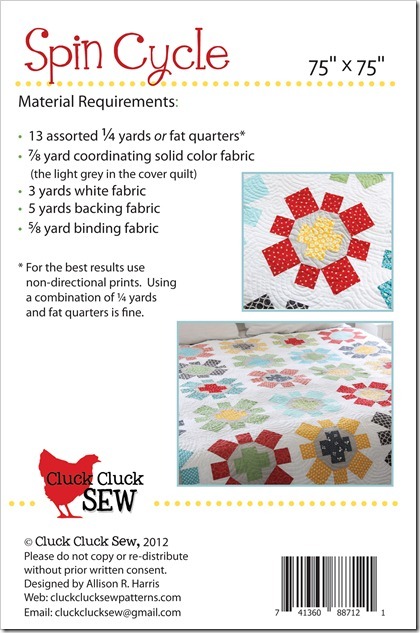 Beautiful quilt and I love that you can use fat quarters because I have so many! I absolutely love this, but am not sure I could tackle something that big. Are there any instructions included for how I could size it down?? Gorgeous! I completely understand why its your favorite! The quilt is gorgeous! Beautiful colors. oh me too! i love love love this one the best of all! I bought the pattern and look forward to trying it! I love it too. And pow wow. They're both so cute and cheerful. Great designs. Congratulations. And I love the covers for both. Very well done! Very pretty! Definitely a stand out favorite! What longarm pattern did she use? I love it! This is beautiful and I love it. LOVE! And love Pow-Wow too!! Both happy beauties! This is a beautiful quilt, Allison! 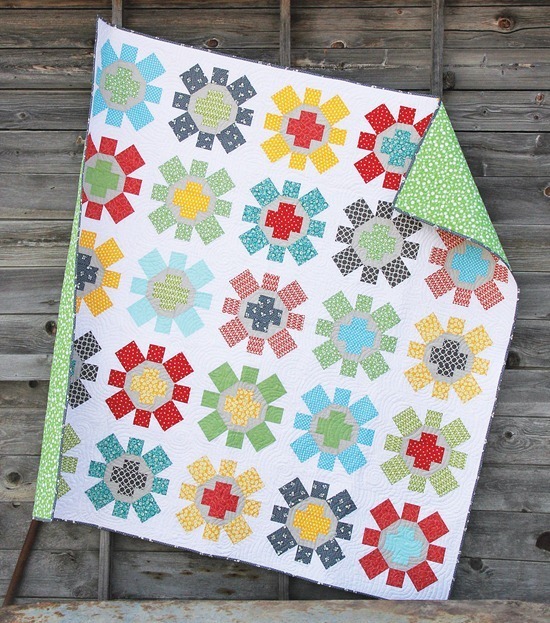 This is such a happy quilt and I love your colors. I ordered the pattern and can't wait to make it. It will be a great summer project. Great colors..the pattern is identical to our ambulance dept. patches and the back of the ambulance. Love this quilt. It makes you feel happy. Great colors. I love the name of the pattern! It appears like I am looking into the washing machine and watching it spin. (if it were possible now in this day of safety first) It also reminds me of a big flower in each block. I may be back to order this one! Gorgeous. I'm going to order a few of these patterns tomorrow before the sale ends. I live for your patterns! What is the grey fabric? Kona Ash or a lighter color? I was going to make your hourglass quilt in pinks and greys, but this one has stolen my stash :) I love that they look like flowers! Do you sell your blankets? I don ' t sew but LOVE this and would love to own it! Do you have a list available of the fabrics used? I can't figure out what some of them are? 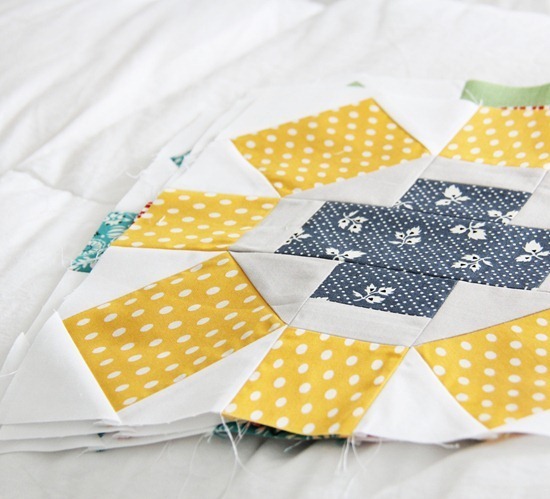 This quilt is so delish and is so gorgeous I bought the pattern to make one just like it! Beautiful work!! !